Welcome to AMARK AMX / JAVELIN PARTS. We are your source for AMX and Javelin Parts and Accessories. Amark AMX/Javelin Parts are made and sold only through us. 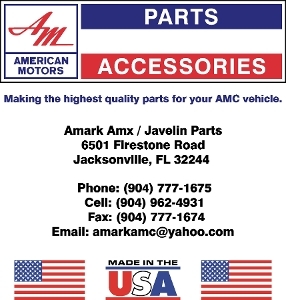 We specialize in 1968-70 American Motors AMX & Javelin cars although you will find a small selection of other AMC parts. Our new website will list all items we offer and is updated frequently with new items. Please be sure to check back often for new products. If you have any questions, comments or do not see what you are looking for, please feel free to call or send us an email.